Thursday night Noticing New York delivered testimony, which I am providing in this post, at the Empire State Development Corporation's (ESDC) hearings on eminent domain for Columbia University’s expansion into West Harlem. The testimony, which is brief and confines itself to eminent domain highlights, stayed just within the three minutes allowed to those wishing to speak. (At one point I understand there was confusion about whether five minutes was going to be allowed.) I have already posted on Noticing New York a much longer and considered letter about the proposed expansion delivered as testimony when the proposed plan was being considered by the City Planning Commission. Immediately following the Noticing New York testimony below are some additional observations about the hearing. I offer this testimony in opposition to the use of eminent domain as an attorney experienced in real estate and as an urban planner. In theory, the Empire State Development Corporation is holding this hearing to determine if eminent domain should be used for the Columbia University expansion into West Harlem. In theory, you will not treat the answer to this question as preordained. If the question is considered in a balanced and fair fashion the Urban Development Corporation doing business as ESDC will not use eminent domain. 1. Do not underestimate the extent to which eminent domain will be used: Use of the threat of eminent domain IS the use of eminent domain. 2. Do not underestimate the financial value of eminent domain to the university when it acquires land at reduced prices. 3. Do not underestimate the high and unreimbursed price that is paid by those condemned in terms of unplanned for disruptions, dislocations and forced transaction costs. If the condemned defend in any way against the condemnation they will have costs. If they acquiesce to the condemnation, costs do not go away notwithstanding that the whole process is only for the benefit of those taking the land. 4. Remember that when a neighborhood is gentrifying or “unslumming,” as Jane Jacobs would say, opportunistic condemnation essentially knocks the existing community off the up escalator so that opportunities belonging to them are seized by those doing the condemnation. West Harlem, like so much of the rest of New York, is unslumming. 5. Don’t forget the economic depression forced on a community when permission to condemn is given and the threat of it hangs over a swath of the community for an extended period, in service to the convenience of the party that wants the land but only at some unspecified future time. 6. Don’t forget that value of the upzonings is an economic lure to the university but that this value does not rightfully belong to the university but to those from whom land is being taken. 7. Do not underestimate how unfair are the pre-existing and preferential relationships between Columbia, ESDC and AKRF and do not discount what it means that Columbia proposes to be drastically empowered to take land with a no-bid process. 8. Do not fail to appreciate that you are by choice unnecessarily side-stepping processes which are called for by the City Charter. 9. Other means of development are better for the community. That is originally what Columbia was considering. Is such an alternative approach now undesirable just because it would not afford as much real estate profit for the university? Last week I was in Savannah, Georgia were the technologically avant garde Savannah College of Art and Design is expanding at a far more rapid rate than Columbia. Its adaptive reuse historic preservation program houses an incredible gamut of programs. It is embraced by, enriches and economically uplifts the community rather than destroying it. Only 3 of SCAD’s 90 buildings have been built new. 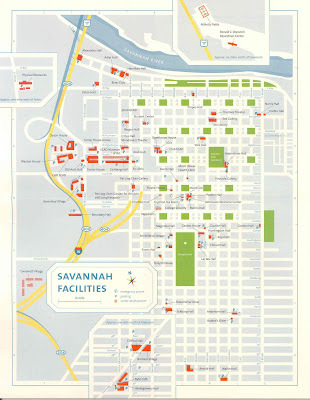 SCAD has not attempted to build a completely contiguous campus, but the buildings are close and that is something that is also possible here. I also offer you herewith an article I wrote that appeared in the New York Sun which continues to be highly relevant to your considerations. I can’t personally tell you too much about the entire hearing. Oral testimony was taken in four separate sessions, (Tuesday, Sept. 2 and Thursday Sept. 4: 1:00 PM & 5:30 PM sessions). I only attended the last of those. Technically the record is still open and written and e-mail comments may be submitted until 5:30 PM on Friday, October 10, 2008. I understand that the community was out in force at the earlier sessions. A Columbia Spectator article published after the first day of hearings: Fight Against Eminent Domain Grows More Fierce, By Betsy Morais, September 3, 2008 describes the “tension in the room” as “thick” and recounts, “Of the many people who spoke at the hearing, only a handful came out in support of the University.” An article appearing in the New York Times the day after the final session I attended (Hearing on Columbia Plan Elicits Emotional Speeches by Timothy Williams) reports that most speakers who did not have financial connections with Columbia University opposed the plan. I don’t know how many of the four sessions Timothy Williams attended but this was certainly true for the session I was at, as was also commented upon by two of the community speakers. A young woman testifying when I was there commented that she noticed that the “majority of the speakers” speaking in favor of the plan were “employed by the University” and submitted that this was “not the way to build a strong or objective case.” She suggested that the University has “repeatedly disregarded the community” and that the University’s conduct now “crowned that disregard.” Her choice of the word “majority,” was a bit of an understatement. A young man who spoke shortly after said that the “overwhelming number” of speakers in favor of the plan stood to benefit through the construction or jobs and that while this might be good for the individuals in question this “in no way justifies the project itself.” The same young man observed that the University not only had other undeveloped properties but was not being forced to declare exactly what the wanted all the land for or how they would use it. He expressed skepticism about certainty all of the expansion would be built, opining that it, whether or not it was, the University would have real estate profit. My observation is that speakers who have business or employment reasons to speak in favor of the University plan are frequently not scintillating. Boilerplate can be stultifying. The boilerplate may brim with collected numbers but in the audience people wondered about the sense of agglomerating statistics about undergraduate overcrowding if the proposed new campus is not going to serve the undergraduates and if Columbia already had other properties available and unutilized for this purpose. The mind can also blur when speeches from members of the community ramble down emotional trails but I have rarely listened to community testimony without thinking of the “wisdom of crowds”or the sincere appreciation Jane Jacobs expressed for the insights and intelligence that come out of community hearings. The ESDC hearing was held in Aaron Davis Hall at City College. This was the same location where the City Planning Commission held its community hearings on the alternate plans for the University’s expansion into West Harlem. For that last hearing, the Hall was filled with all the commissioners of the City Planning Commission in person. By contrast, this time the official audience for the hearing was a single independent hearing officer (assisted by a stenographer) whose job it will be to produce and furnish a record to ESDC. The hearing with its four sessions (and ongoing comment period ending October 10, 2008) will produce a dauntingly voluminous record. Lawyer Norman Siegel* and his firm, representing Nick Sprayregen, one of the property owners to be condemned, submitted four telephone-book- size volumes of supporting material for the record. One has to wonder how thoroughly the ESDC board will acquaint themselves with the hearing record. What Might Be Heard of a Translated Message? Much of the flavor of the hearing will undoubtably be lost upon its translation into a dry transcript. I have a professional familiarity with these things though: The ESDC members will acquaint themselves with what happened at the hearing if they want to. The question is what will make them want to? What will make them want to? That is the job the community has ahead of it. There is also the question of those who may be communicating to the ESDC decision-makers to the effect that those decision-makers really need not concern themselves with what the community expressed. As I exited the hearing, a lawyer approached me whom I knew from when we worked together on public financings when I was in government He noted the firmness of my opposition to eminent domain expressed in the hearing and observed that this did not seem representative of the “clear thinking” for which he had always known me. He said that he thought several of the points I’d made were incorrect. I asked him what he thought I had gotten wrong. He suggested that I was wrong on the subject of below-market under-compensation of those whose property was condemned. I said that, by definition, forcing someone to take less for their property than they were willing to sell it for, forcing them to take instead what someone else said they should get for their property was to pay a price that was less than a free market price. (I recognize that potentially coming into play is a very sophisticated discussion that can be had about what economists refer to as the problem of the holdout. We did not get into this.) There is also the way in which an eminent domain takeover of a neighborhood can depress the market: one woman at the hearing session suggested that vacant properties already acquired by Columbia were having a depressing effect. My colleague suggested that I should be content that judges in condemnation proceedings would set fair prices for property because they were independent. That, of course, presumes that condemnees hang in long enough to go through to the end of judicial process. In all the litigations I have been involved in of any sort I have found the parties weigh the uncertainty of outcomes and consider discounts on their claims because of the stress and taxing nature of the litigation itself. I asked him about the disruptions of the lives of those from whom Columbia would take property. “For instance?” he asked. What about the difficulty of planning or running a business and trying to keep your property leased when it is under threat of condemnation. He told me that he didn’t think that any of the owners had problems leasing their properties, that they didn’t have leases. “What about Anne Whitman?” I asked. He said that Anne Whitman may have had problems with leases but that Anne Whitman had sold. I reminded him that first point I had made in my testimony was that the extent to which eminent domain is used should not be underestimated because use of the threat of eminent domain IS the use of eminent domain. My colleague suggested that my point about the disruptions to the condemnees also needed to be reconsidered in that some of the cost of the transactions forced upon them were reimbursed if adjudicated. Admittedly, this is an anecdotal response, but the father of a friend of mine had the business he had run all his life condemned out from under him. The condemnation process setting the value went on for years. He never reestablished the business. One might suppose with his eventual compensation he enjoyed the opportunity of an early retirement that he that not otherwise been afforded but I will accept the deep bitterness of his daughter over the retirement she said he did not want as sufficient evidence that this was not a happy outcome. It was not his chosen time to retire. My colleague suggested that the key to considering these matters was that the “good of the many should outweigh the good of the few.” I told him that I did not think that was what the bill of rights was about. This formulation is the basis in a Star Trek movie ("Star Trek: The Wrath of Khan") for the logical Commander Spock to willingly and altruistically self-sacrifice himself to save the Starship Enterprise ("The needs of the many must outweigh the needs of the few or the one. ")* Aside from self-sacrifice, there are decisions where someone else’s sacrifice may be commanded, particularly in the military where this kind of balancing comes into play. I don’t see that it has ready application here. We have come a long way since the Greeks, according to western tradition, invented “democracy.” In the beginning, in its pure form, “democracy” did not recognize the value of individual rights. Whatever the majority was willing to vote for was good. The early Greeks followed a practice of ostracism. Once a year the majority of Atheneans could vote for one person to be forced to leave the community for 10 years. No reason was required: if the majority voted this way this was the result. Ostracism was used surprisingly by Athenians to expel Themistocles the statesman and military hero famous for saving Athens by convincing the people to build the fleet of triremes that saved the city from the Persians. But since the time of the ancient Greeks we have come to respect individual rights: majority rule is not enough to dictate outcomes. I asked my colleague whether he didn’t find it troubling that, rather than dealing with a discrete short-term, government initiated, defined and bid-out project that we were dealing instead with a private institution using eminent domain over decades on a schedule that would be developed and applied for the institutions own self-and-future-determined convenience. Didn’t this make sense, asked my colleague? Didn’t it make sense that Columbia should be able to use eminent domain over time as it is needed to expand and not sooner or later? If Columbia wasn’t now sure of its plans or when (over the decades) it would be best to take the property, shouldn’t flexibility be accorded? What I wanted to know was how was it right for this flexibility to be at the expense of the rest of the community? Why doesn’t this become a general right of condemnation on Columbia’s part? Because this is a single approved project submitted my colleague. But this covers a plan for expansion over 25 years: why 25 years of continuous expansion? What happens when Columbia continues to grow after those 25 years as it surely will? What happens then? Doesn’t it seem that the number of years has been calibrated to make seemingly reasonable Columbia’s plan to get exactly the basket of land Columbia has asked for permission to acquire? Didn’t I appreciate this as an urban planner, my colleague wanted to know. Didn’t I think the ability to comprehensively execute such a plan with such control was a good thing? My colleague wished good luck to Noticing New York, which I had explained to him is relatively new. and arts schools and a science building." If “sleek” means shedding all ties and references to the cultural landscape from which it is emerging, Williams may have hit upon the right word. There are other ways to develop. The Savannah College of Art and Design which I mentioned in my testimony offers design curriculum about the art of taking the cultural landscape into account. As I commented, the school is fast growing and technologically avant garde. It adaptively reuses existing historic buildings and uplifts a community that adores it in exchange.